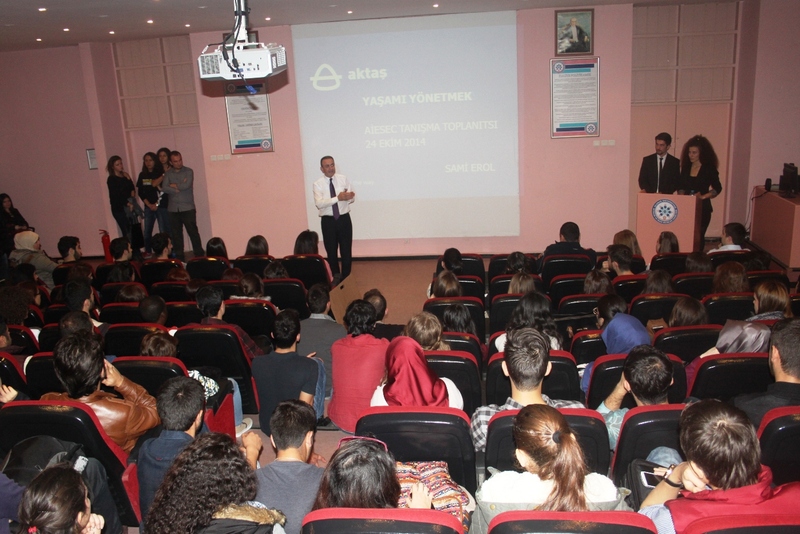 Aktaş Holding, which is the leader in Turkey and among the first three companies in the air suspension bellows sector, continues to gather with the students in almost all kinds of activities organized in various educational institutions. Sami Erol, president of the executive board and member of the board of directors of Aktaş Holding, entered in the name of Aktaş Holding to the acquaintance meeting of AIESEC, international internship exchange program, performed in Uludağ University in the previous days. Erol, who made a presentation with the subject of “managing the life” to the students in the meeting realized in the Bordo Hall of the Faculty of Economical and Administrative Departments, Uludağ University, gave recommendations worth gold which will help the career planning of the students. In his speech made for the youth; saying that “You should be able to plan the future. Otherwise, you define any problem in front of you as life. However if you plan future, you see the opportunities you get and add value to your lives”, Erol said that “How much value a person adds his/her life, he/she can define the expectations related with happiness that much”. "AIESEC is an opportunity for you"
Sami Erol, a member of Bursa Branch of AIESEC at the same time, pointed out the importance of the successful studies made by AIESEC in the road to the world citizenship. Erol used the expressions of “AIESEC is one of the platforms, maybe of a limited number, which may ensure that you can use the roads to the world citizenship. I sincerely believe in that the individuals, like you, having high potential, can take correct decisions in this direction and guide their targets correctly”.